I was at Urban Outfitters the other day when I heard a song that went something like "I know there's nothing to say, Someone has taken my place. When times go bad. When times go rough..."
Geeeeeez…what is your problem man? Why are you making such a big deal? First off, there is so much noise in your stupid store I could barely hear the music. Secondly, I haven’t heard that song in years. Thirdly, I could have shazamed it, but my phone has no reception in the shop. To be honest, I didn't understand why he got all riled up. Fleetwood Mac is one of my mom’s favorite bands: what does it have to do with a 20-something with skinny jeans, thick-framed glasses, suspenders, handlebar mustache, and hair that looked like he'd just rolled out of bed even though everyone KNOWS it took him at least a 1 hour to get it to look that way? I looked it up on the internet and apparently there’s a hipster-led Fleetwood Mac revival going on right now. A full-on Fleetwood Mac hip-steria. The hippest indie-bands around, all want to sound like Fleetwood Mac. Some went as far as releasing Fleetwood Mac tribute albums and “Fleetmac Wood” parties are held at the hippest joints. Don't mess with hipsters and their music. Now I know. Anyways, I downloaded on iTunes “Rumors” by the Fleetwood Mac and I’ve been listening on repeat for the last couple of days. It is such a good album, it is hard for me to say which songs are my faves because I really love the entire album. But now I get why the hipster clerk was so upset, and maybe over reacted a bit. This album is no joke. It’s a classic. And so is this Thai Sweet Chili Glazed Salmon. Let’s start from the marinade: It is absolutely delicious. 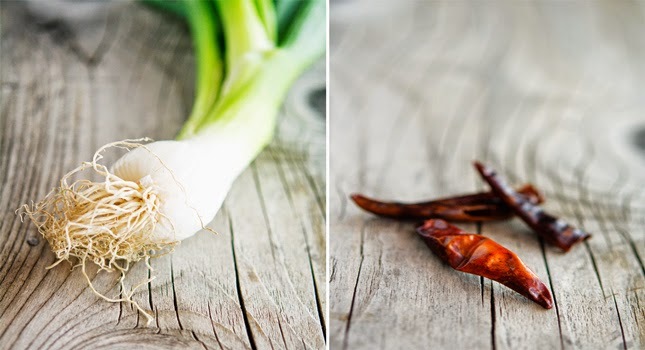 First you taste the scallions, garlic and tamarind, then the raw coconut sugar and the lime, and then the hot comes with the chili taste. The fish sauce and soy sauce bring a pleasant umami kick. It’s fresh, tasty and you can modify it to satisfy your taste buds. All in all, this is a simple, easy and delicious salmon recipe. 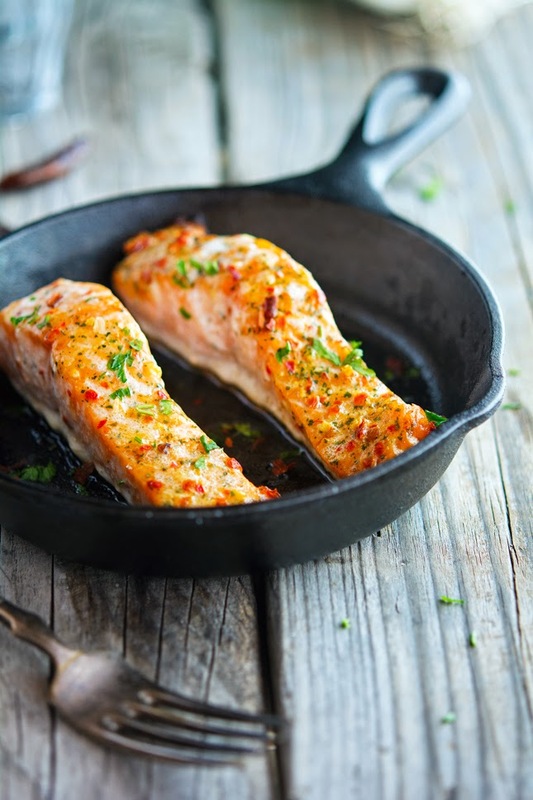 If you love salmon, you will love this marinate; it brings out unique and awesome flavors. I like it to serve it with roasted broccoli or cauliflower mash, but I'll leave it up to you. Give it a try though, this Thai Sweet Chili Glazed Salmon is hip, Fleetwood Mac hip. Thai Sweet Chili Glazed Salmon Print this recipe! Heat olive oil in a small frying pan over medium-high heat. Add scallions and garlic, and saute’ until light golden brown and slightly crispy about 2 to 3 minutes. Remove garlic and scallions with a slotted spoon from the oil and transfer to a food processor (or a pestle & mortar). Leave remaining oil in the pan. Return the paste to the frying pan and stir it into the oil over low heat, gently simmering until you get a fairly even consistency, a couple of minutes should do. Adjust the consistency by adding a little more water if you find it too thick. In a shallow dish combine Thai sweet chili paste, soy sauce (or coconut aminos) and grated ginger and mix until well combined. Add the salmon fillets, skin side up and marinate in the refrigerator for at least 1 hour. Line a baking sheet with aluminium foil and lightly grease it with olive oil (alternatively you can use a cast iron skillet). 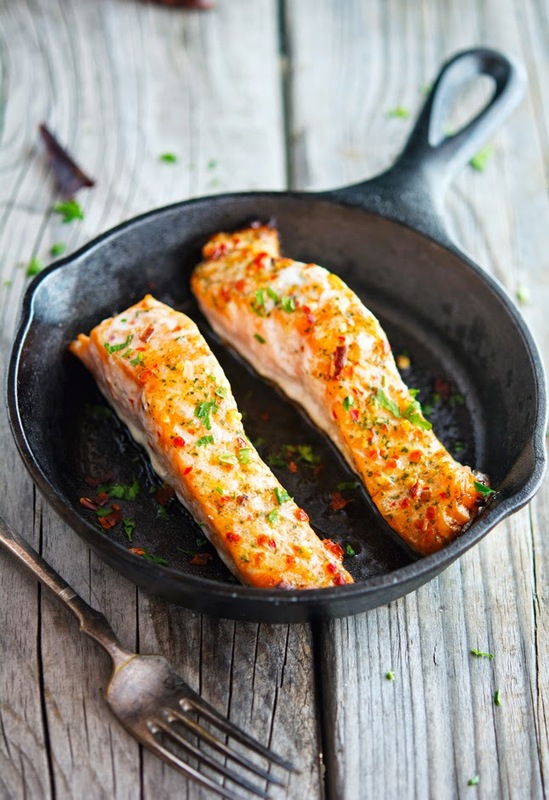 Place salmon fillets onto the prepared baking sheet, skin side down, and drizzle some of the marinade over them. Cover with aluminium foil and bake for 15 minutes, turn on the broiler, remove foil, and broil for further 3 minutes or until the top is golden brown. Transfer to a serving platter and serve! One serving yields 401 calories, 28 grams of fat, 6 grams of carbs and 34 grams of protein. ROFL. Who knew? One of my hubby's all time favorite bands. The salmon sounds delicious. Need to give it a try for our next fish night. Your hubby is the man. Period. In my slightly-over-a-year of blogging, I don't think I have seen many (if any) people use tamarind paste in a recipe! I am impressed Mike! My mom uses tamarind in a lot of her curries and sautes - and it does add a wonderful depth of flavor - I bet this salmon was deeeeeeeeeeelicious!!! Fleetwood Mac is one of my mom's fav bands too - but my fav line from your post is about the "20-something with skinny jeans, thick-framed glasses, suspenders, handlebar mustache, and hair that looked like he'd just rolled out of bed even though everyone KNOWS it took him at least a 1 hour to get it to look that way"!!! Wow this looks amazing! Gotta love a pissed off hipster! I haven't used tamarind paste before but will keep my eyes open for it next time I'm looking for spices! Thanks for sharing! Tamarind paste adds a delicious je ne sais quoi to dishes, you should totally get some! This looks incredible Mike, and the description of the UO hipster store clerk cracked me up! 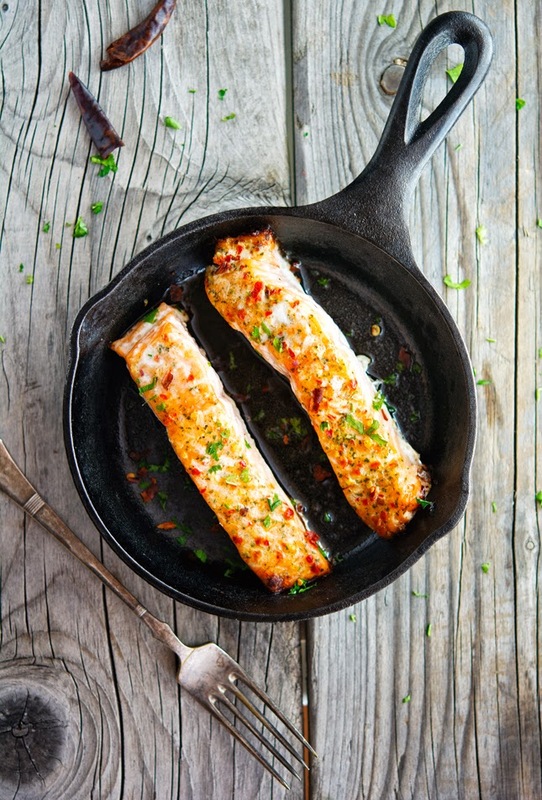 I would RISK getting scalded by that cast iron pan, just so I could snuggle with that scrumptious looking salmon! Watch out though, that cast iron pan is heavy! If there's one thing I can't stand, it's an arrogant hipster. :-) I used to love salmon! I can't eat it anymore, but I can drool over your delicious pictures! I love reading your blog Mike!! And the flavors in this salmon dish are amazing. Added to my to-make list for sure. Mike this salmon looks amazing! Salmon is a weeknight staple in my household so I definitely will be recreating that Thai sweet chili glaze to go with it. Looks divine and jam packed with flavour! It is jam packed with flavor, and soooo good! The thing I love most about Fleetwood Mac is their varied sound - most bands have a certain sound and they stick to it! 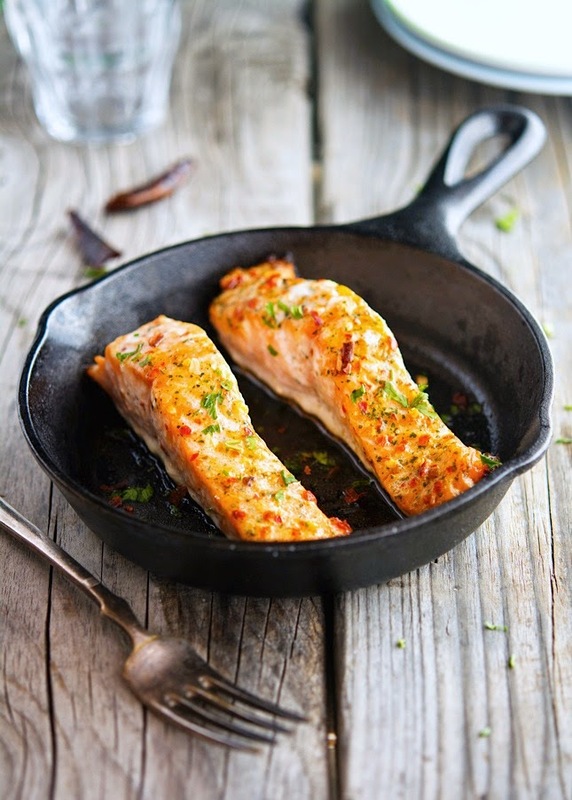 This sweet chili glaze sounds mouthwatering and the perfect compliment to the richness of salmon! FM are amazing indeed, their music is still contemporary, how amazing is that? This looks delicious! I'm excited to try it. One thing...did you mean scallion in the ingredients list? then you need to adjust your recipe directions as you continually use shallots in them. Hi Mike, salmon is one of my favorites, always looking for a good recipe. Thanks! I've been wanting to cook more fish. And this just may be the recipe to do it. Loving the sweet chili glaze... heck yes this is #wolfpackeats! It's so funny how UO clerks look the same everywhere around the world hahaha. I loved your description AND the music recommendation - you have such perfect music taste! And also one for sauces.... this one looks delicious! Made this tonight... NOT for the faint of heart!! 3 Tbsp of red pepper flakes seemed like a lot, so we only used 1 Tbsp. Unless you are a food samurai, you must be insane!! This was dish is so spicy it was practically uneatable. Replaced our pinot grigio with milk at the dinner table. Fine dining at it's finest right there. This sauce has tons of potential (the flavours are perfect), but either the author meant to say "tsp" instead of "tbsp", or he truly is suicidal. 1tsp would probably have been plenty of spice. Clearly the red pepper flakes I used are not as hot as yours. Seriously, when I make this recipe (at least twice a month) it's anything but too hot. Anyways, I'm sorry you guys couldn't actually enjoy this salmon because it's truly delicious. I'm definitely going to add a note letting people know that they should adjust the amount of red pepper flakes used according to how hot they are. I hope you'll give this recipe another try tho! I made this tonight and when put in the food processor, it didn't thicken like paste. The flavors and smells are all there but its very thin. any advice on how to thicken it up? You can leave out the water, but I honestly don't know what happened to your paste, because it's very thick. If I don't add the water my food processor can't actually chop the other ingredients! Made this last night. It's AMAZING! Can't wait to make it again next week. How many Shallots should I use? It's not listed in the ingredients?